ATF uses the eRegulations platform to make regulations easier to read and navigate. Regulation data is copied from the Office of the Federal Register website and the GPO FDSYS system and should not be considered authoritative, as those sources are not official legal editions of the Code of Federal Regulations. eRegulations clarifies regulations by bringing related information and regulatory history to the forefront. It is a work in progress and a public domain work of the United States Government. Below are details on some eRegulations features and how to use them. eRegulations is an open source project. Visit the project repository to learn more and contribute. Clear typography makes regulations legible and easy to scan. Responsive design adapts the tool to fit to your screen. Persistent table of contents for fast access to any section of the regulation. 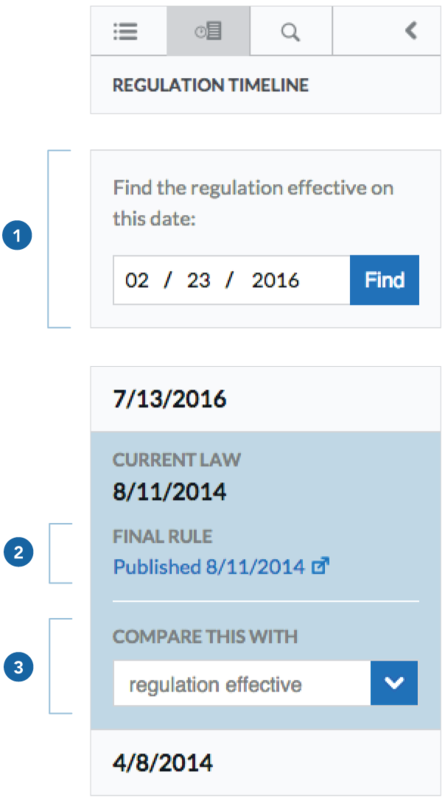 Regulation timeline shows recent revisions of the regulation organized by effective date. Wayfinding in the header makes it easy to know where you are in the regulation and what revision you’re viewing. Search function to find where specified text appears in a regulation. Defined terms are highlighted in the text and displayed in the right sidebar so you can keep your place. References to other parts of the regulation are linked. Some ATF documents that reference regulation sections or paragraphs are collected and linked to on the side of the regulation text. The related documents bar will become light blue when a section has related documents. The regulation timeline shows recent revisions of the regulation organized by latest effective date. The date picker allows users to find what revision was effective on a specific date. Federal Register notice(s) associated with a revision are presented and organized by publication date. These links will take you to the notice on the Office of the Federal Register’s website. 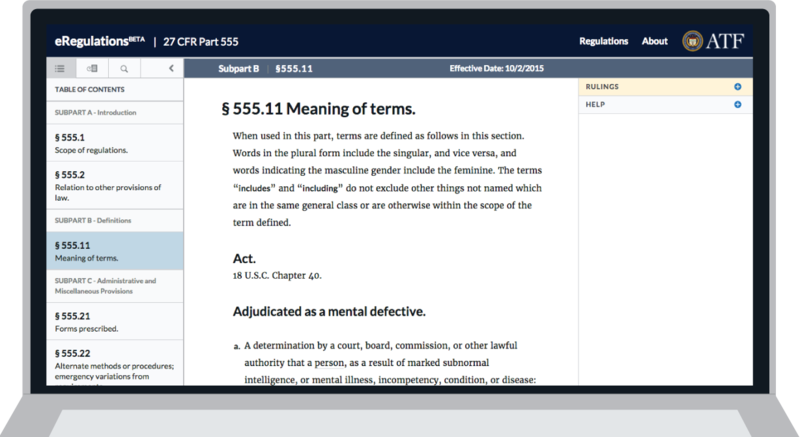 Compare any two revisions of the regulation, word for word, by selecting a date in the menu and clicking “Show Differences”. 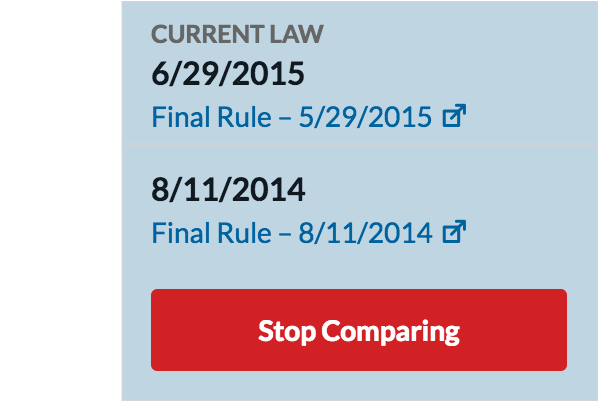 To stop comparing, return to the regulation timeline tab — — at the top left side of the screen. Click the “Stop Comparing” button under the second of the two revisions being compared.